It's A Trap-eze! came out with the Cirque du Soleil Collection. Overall I wasn't too fussed with the collection but I did pick up this one and two others. It's A Trap-eze! 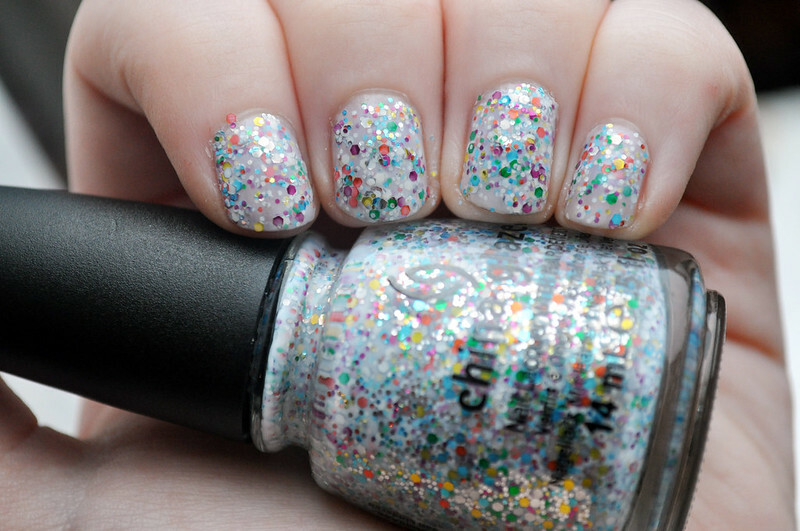 is a multi-colour and multi-sized glitter in a sheer white base. I love it in the bottle but I'm just not sure about it once on the nails. It doesn't apply very well and I don't have the patience to try and apply it nicely. This was two coats with a few little patches of a third coat to try and even things out. I also think it needs a sheer white/pink polish over the top to make the top layer of glitter look better. How beautiful. I'm still thrilled that glitter polishes are more mainstream now. I adore them! I love it,looks so pretty!